Browse our roster of exceptionally talented Artistic Entertainment for hire including graffiti, calligraphy, sand artists, caricaturists, air sculptors… who are available to book for corporate, marketing and private events around the world. Air Sculptors create their work using airflow and lightweight materials to produce pieces of art that seem suspended in the air and play on elements such as wind or gravity to make their artwork unique. 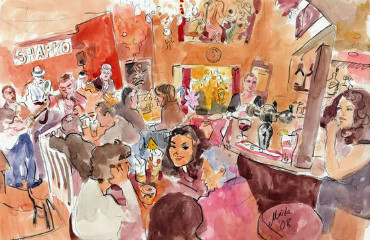 For a touch of humour and artistic ingenuity hire a caricaturist for your event. 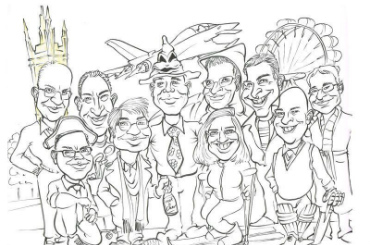 Our fantastic range of caricaturists can create art on paper, tablets, balloons & more are particularly popular at weddings. 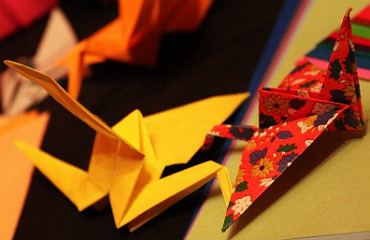 The finest UK origami artists to hire to create small & large bespoke paper designs and intricate designs for souvenirs or as some unique decor for the venue, whether it is a private or corporate event they are sure to be popular with your guests. Hire Silhouette artists if you’re looking for unique and personalised artwork that can capture your guests or event in a special way and which the guests can keep as a memento of the event. 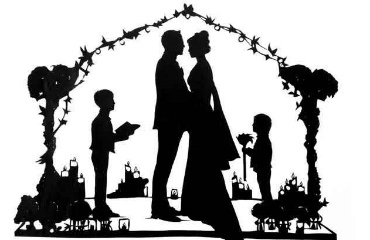 Silhouette artists are particularity popular at weddings. Transform your venue with our breath-taking art installation for hire. 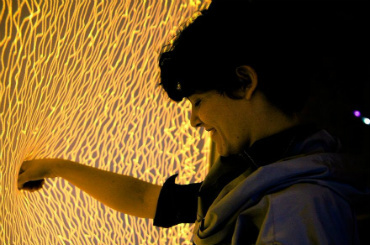 Our talented installation artists cover digital wall mapping, dance, art and much more. 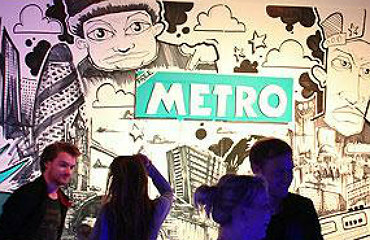 Our clever and inspired graffiti artists can create some amazing artwork for all kinds of events, exhibitions & workshops that will catch people’s attention and have them transfixed as they watch the remarkable artists do their work. Pavement artists will gather large crowds at all type of events, drawing them in to their unique and visually striking pieces of work. Just like a graffiti artist, Pavement Artists can create portraits, scenes and 3D effects and use your company logo and create amazing pieces of street art. Our exciting roster is crammed full of talented speed painters to hire who can create fantastic works of art in a matter of minutes. 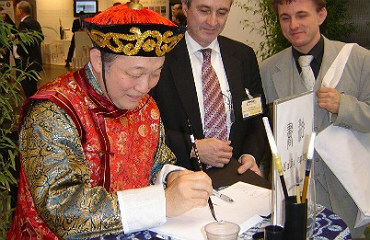 Choose from Japanese & Chinese calligraphy artists, to workshops & shows. 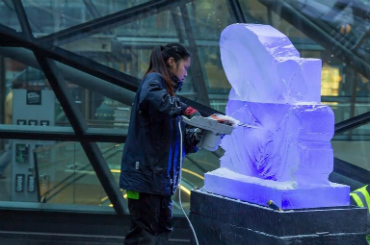 An ice sculptor can be hired to create a magical piece; whether it is a live ice carving, a workshop or a bespoke ice sculpture, it is sure to impress your guests. Bring some of the beach to your event and hire sand artists to sculpt a sensational piece of sand art that will impress your guests. 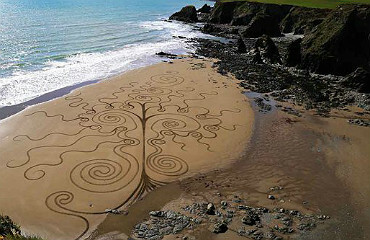 These talented sand artists can be booked for a bespoke work of art that is a great talking point and looks amazing! If you’re looking to have a unique and creative event hire Artistic Entertainment. These artists can contribute some imaginative pieces of work to your event to make it a truly magical experience for everyone, hiring artistic entertainment is a great way to grab your guests attention and make the event an unforgettable occasion. There is a diverse range of amazing artistic entertainment to hire such as Silhouette artists who can produce an intricate piece of work with just some paper and scissors for your guests to take home. There are also caricaturists to hire for a more funny take on a self-portrait or you can book calligraphy artists if you want some attractive writing to adorn any invitations, signs, or menus, they are especially perfect as artistic entertainment for weddings. That’s not all! There are also sand artists and pavement artists who can employ their extraordinary artistic talents outdoors or origami artists to hire for some fantastically skilled paper creations. In addition there is graffiti art which is a very popular form of artistic entertainment; the artists on our roster can bring any wall to life with some vibrant and colourful work. You can hire artistic entertainment with us; whether it is an incredible ice sculpture or a awe-inspiring art installation by an air sculptor, we are sure to find something to suit your tastes. The talented artists on our roster can create some engaging and exciting masterpieces to draw in your guests and leave them in awe. 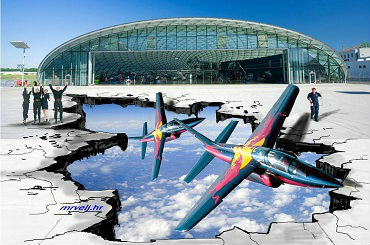 If your hire artistic entertainment your event is sure to be an absolute success. Contraband is the UK’s top entertainment agency, with friendly, helpful account managers who guarantee you fresh artistic entertainment ideas, some gifted entertainers for hire, and the best deals possible. We are booking agents for a huge selection of entertainment to hire, and we can recommend some unique and exciting entertainment or activities for your event. Browse through our roster of Artistic Entertainment and contact us today to discuss a artistic entertainment booking. 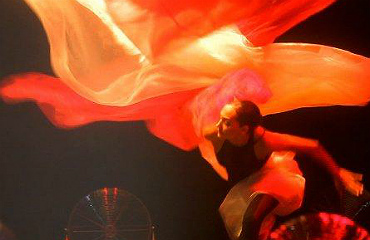 Tell a friend about our Artistic Entertainment available to hire!